When it comes to digital media, we cannot stress enough the importance of imagination and creativity. In its most basic understanding – LED displays allow you to share information. On a deeper level – LED displays allow you to communicate with your target market at the precise moment they want that information. Did you catch the Patriots win over the Rams in the Super Bowl earlier this month? Did you notice the LED displays around the arena or along the sidelines? Did you see how easily they changed for the halftime show to offer additional lighting and display features during Maroon 5’s performance? If you didn’t, that’s okay. What we are trying to say is that LED displays can be used in a variety of ways – you have a communication problem? LED displays are the solution. 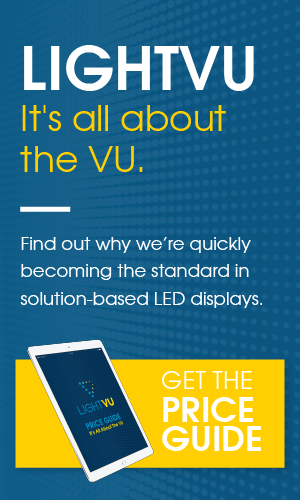 It doesn’t matter what industry you are in, chances are LED displays will help you increase leads and sales; they will also help you connect and communicate with your customers. The current rate of growth in technology means you need to constantly engage, inform, and entertain your clients. The speed in which you can communicate breaking news or updates to your customers is unparalleled when it comes to LED displays. We can agree that sports bring people together. The four major professional sports leagues (NHL, NFL, NBA, and MLB) create a gathering place for tens of thousands of people on a regular basis. So, imagine you’re at a game waiting for your favourite team to make their big entrance. All of a sudden, everything goes dark. Next thing you know the entire building is lit by the faces of your favourite players. The best plays, biggest hits, and highlights from the season are all being played across every LED display in the building. Out come the players, one by one as their faces are shown for everyone to see. Now that’s an entrance. Wouldn’t you say? Have you thought about how much time you spend waiting in lines? Studies vary, but claim that the average person spends two to five years of their lives waiting. That’s a lot of time standing there not doing anything other than waiting. Picture yourself waiting to check-in to your hotel. You’re hungry because no meal was offered on your flight and exhausted from your travels so you don’t want to leave the hotel. You look up behind the check-in desk and there’s an LED display playing a video for the in-hotel restaurant. The chef is making their signature dish, showing you exactly how it’s created from start to finish. The video captured your attention through your wait in line and gave you dinner plans. That’s a win, win for you – killing time in line and finding a place for dinner. It’s also a double win for the hotel – distracting your wait time and attracting another customer to their restaurant. Brilliant. Point-of-sale LED displays can encourage impulse purchases. You think stores are stocking the shelves beside their tills because they don’t have enough space in their store? Wrong. This is your last chance to add to your shopping cart before you pay for your items. People in line are already spending money, why not urge them to spend more? Put up a display to remind them that superstars, Britney Spears and Beyonce, drink Pepsi or that Betty White wants you to eat a Snickers. Date night? Don’t forget to grab some gum! The list goes on and the opportunities are endless. What a time to be alive when we aren’t restricted to single display viewing. Technology has evolved so that multiple screens can “talk” to each other simultaneously; they can work as a team or as individuals. Take the photo below; this is quintessential Times Square in New York City; digital displays lighting up the street promoting everything and anything they want. Take a close look at the multi-screen towards the bottom left corner; together, the displays are creating an image to promote The View; the graphic spills over from one line of screens to another. Imagine how much information you could share when you use each row individually, instead of altogether. You could promote multiple events at one time. Win, win. Do you have questions or are you ready to move onto the next step in your purchasing process? Contact us, we would love to help you out! Previous PostPrevious What are LED Displays Used For? Next PostNext LED 101: How to choose the right LED display manufacturer?